Young children in nursery schools are perhaps most at risk of harming themselves due to unsafe radiator temperatures. But, with Contour’s low surface temperature range, you can eliminate the risk of burns, allowing children to learn and play risk-free. To further maximise children’s safety, Contour LST designs incorporate bullnose corners to prevent sharp edges and avoid any injuries that could occur as a result of this. In nursery environments, the spread of bacteria is unavoidable. As children learn and play outdoors, and with each other, they are constantly exposed to microbes. 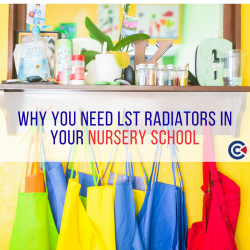 Warmer surfaces increase the spread of bacteria, which is why radiators are one of the worst culprits for contamination in nursery schools, especially during winter, when heating is on the rise. It only takes one child to touch a radiator, and illnesses soon spread. Not with BioCote® though, the leading providers of silver anti-microbial technology. BioCote® additives permanently inhibit the growth of 99.5% of bacteria within two hours, with the aim of improving hygiene. It only takes 15 minutes for BioCote® to force a noticeable reduction in the bacteria on a surface. Case studies show that a non-treated classroom was shown to have 96% more bacteria overall on unprotected surfaces than a BioCote®-treated classroom. In fact, absenteeism was 20% lower in the treated classroom. For maximum hygiene, you’ll need an efficient cleaning routine for your nursery school LST, anti-microbial radiators. With Contour’s easy-to-clean LST radiator covers, your cleaning budgets will decrease, your time spent cleaning will decrease, and your nursery school hygiene will improve. We recognise that nursery schools need to prioritise space for children to play and take part in educational activities. Large radiators can create obstructions that make learning activities difficult. Contour’s LST radiators are slim models that are designed for space efficiency. This doesn’t have any impact on the heat output of our LST heating product range. Contour recognise the importance of non-disruptive environments in nursery schools. It’s because of this that we complete 100% of the manufacturing process before installing your LST radiators and radiator covers. We’ll carry out all modifications prior to installations to ensure efficiency, minimising hassle for you. Recent research from colour psychologists concludes that certain colours benefit children in different ways. For example, Fisher-Price, leading provider of children’s toys, advise avoiding yellow and patterns in young children’s environments, which can be excessively visually stimulating for young children, causing distress or aggravation. Fisher-Price recommends warm colours like red and orange for playrooms and neutral colours for rooms where you want to encourage sleep. When you re-decorate your nursery around children’s colour psychology, why not invest in safe surface temperature radiators to match? Contour will manufacture radiator covers in almost limitless shades for your nursery environment.